There is something I love almost more than eating. Yes, I know – big claim! I love, love, love when someone gives me a recipe. Especially when it’s one of those recipes that you don’t find in any cookbook – the true family recipes passed down from generation to generation. And when the holder of the knowledge invites me into the kitchen for a masterclass, well I’m pretty much hyperventilating with excitement. Last weekend, I was privileged to be able to experience all of this as I watched my friend Siddhartha’s Mum Anju Singh make short work of Bedmi Aloo and a Pumpkin Sabzi, a dish that’s eaten enthusiastically all over north India and one of my absolute favourites. 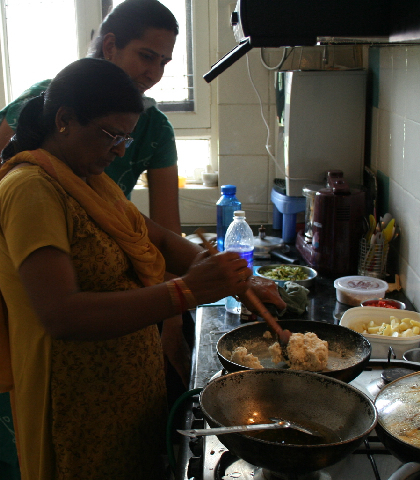 Before we arrived, Siddhartha had started writing down the ingredients and quantities – the first time Anju’s Bedmi Aloo had been chronicled in this way – his Mum always cooks by instinct rather than by slavishly following Nigella, Jamie and Anjun like me. Anju confessed it was extremely hard to start thinking in precise quantities after a lifetime of ‘a bit of this, a bit of that’! First up was a dal-based filling for the Bedmi, the gorgeous, puffed, deep-fried bread that has been my downfall since I came to India. Most of the food prep had happened earlier, TV cook-style, so there was already a bowl of course-ground (to make sure there’s a bit of crunch in the finished bedmi) Ural Dal (200g soaked overnight then a pinch of Hing/Asafoetida added in the morning) ready to use. Then the thick paste has to be fried in about 3 tablespoons of sunflower oil in a non-stick or heavy karahi You have to keep stirring furiously because the paste will stick to the pan, adding more oil if necessary. While stirring, add the spice mix: 1 T ginger paste, chopped green chilli and red chilli powder to taste along with the following, dry-roasted and ground: 1 T fennel seeds, 1T coriander seeds, 1 and a half t cumin seeds, half T peppercorns, 10 cloves, 4 whole black cardamom. Keep stirring until the mixture looks sandy with powdery, separated grains. Stir in 2T chopped fresh coriander. By the way, things were moving so fast I struggled to keep up with photos and now realise I have no shots of the potato! I think Anju has at least two pairs of hands because she was also making a pumpkin dish at the same time. For this she defied the health police (I’m always all for that!) and tempered some spices in mustard oil – in 1T of oil she fried a pinch of hing/asafoetida, heaped half t of methi/fenugreek seed, 1 and a half t of cumin seeds and 20 small garlic cloves, chopped. Fry for a couple of minutes until the garlic starts to brown then add 2 dried red chillies, 2 medium onions chopped. To this add about one and a half kg of pumpkin chopped into small pieces. Anju’s pumpkin, she called it ‘kumhada’, was a lovely creamy yellow colour, definitely what I’d call a pumpkin rather than a squash. 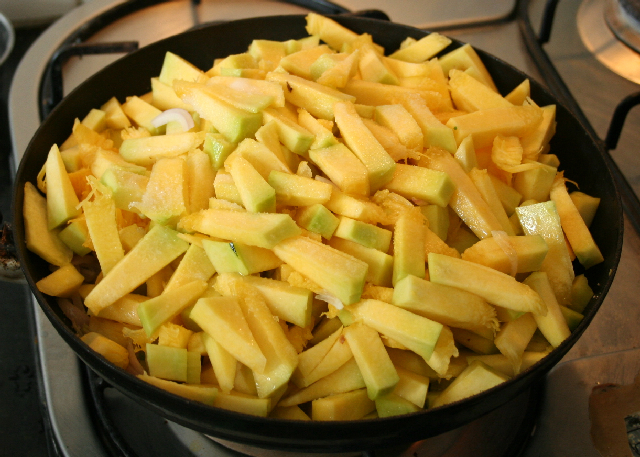 With salt to taste, the pumpkin is left to cook for about 45 minutes, stirring occasionally until completely tender. Stir in 1t of dried mango powder (amchoor) then mash slightly. Now it was time for the Bedmi to be assembled and fried. In a karahi, about 3 cm sunflower oil was heated. 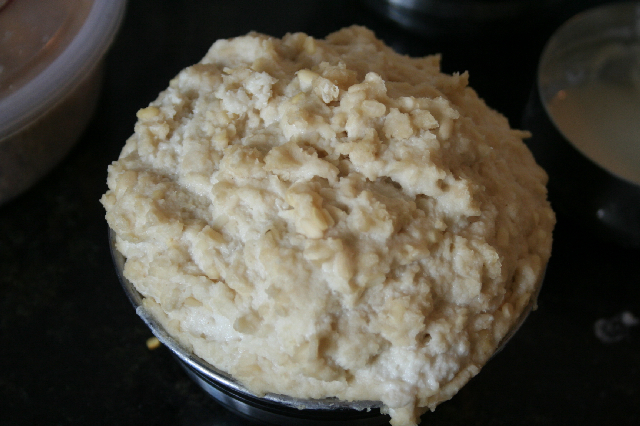 The dough had been made earlier with 2 and a half cups of wholemeal flour (atta), half t of salt and 1 and a half T sunflower oil and enough water to make a firm dough. Anju’s hands were a blur as she broke off nimbu-sized pieces and rolled them into smooth balls. She then pushed them into a cup shape with her thumbs and inserted about 2t of the urad dal mixture. she then brought the sides of the dough up over the dal to enclose it then rolled them out flat. 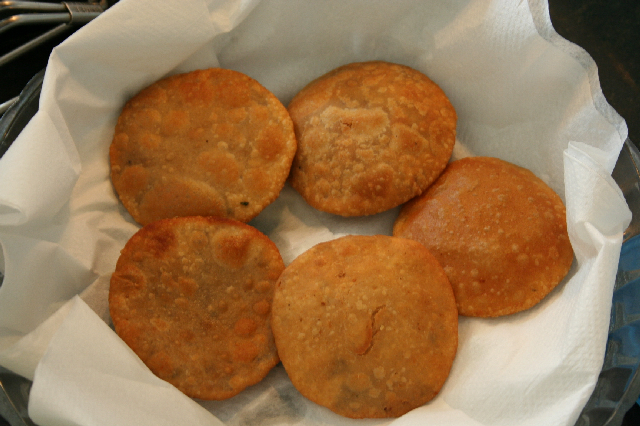 Interestingly, Anju called her ‘Bedmi’, ‘Kachori’ which I know as the smaller, harder deep fried breads. Actually, when it came to frying, I could see that these breads were a little on the kachori side of the spectrum, cooked slower and longer than I associate with the instant puffing up of bhature or puri. 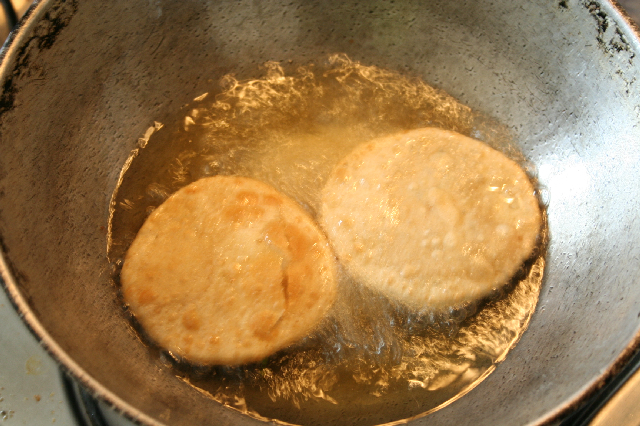 Each bedmi was oiled then slipped into the hot oil. Turn the bedmi over after about one minute and keep turning until a rich golden brown then drain on kitchen roll. Needless to say, the resulting feast was amazing – I’m still reliving it daily – the crispy, spicy bread; the soft comforting potato and the surprising sweet pumpkin made for a meal I’ll remember for a very long time. Thank you so much to all of the Singh family, the afternoon was an absolute delight. But most of all, huge gratitude to Anju for sharing her family recipes and letting me invade her kitchen and watch a master at work! By the way, if this all sounds like an invitation to bombard me with family recipes – great! Bring it on! We had a great time as well, Pamela. It is a different matter that oil rationing in our house has gone for a toss since my mum came visiting ! Yes a lovely dish – for breakfast with some thick Lassi – perfect sunday meal. Looks easy but actually needs lots of practice (and lots of Bedmi which look like UFOs). That must have been fun….. The taste i can well imagine…..as you say it is more on the kachori side of spectrum , this is the UP version of bedmi n is actually called kachori. bedami is a western UP and Delhi name and you’ll be surprised to know that it is called bedayin in MP . Ingredients and cooking methods are the same , just the size n thickness of the bread differs…….and all of them taste awesome ( and are served with the same accompaniments ). The pumpkin skin subzi you skipped ..
Not for the faint hearted !! both the Bedmi and the pumpkin soak in too much of oil 🙂 Awesome combi and taste but to be indulged, once in a while… BTW, the Bengalis also have a similar recipe to Bedmi called the Radha Ballabhi, its usually served with Aloo Dum or Cholar Dal. The Bijoli Grill in Dilli Haat has it on its menu so does most of the Sweet shops in C.R. Park. Hi Sangeeta – I think the pumpkin skin subzi was for another day! Lets do the jalebis soon – when is good for you? Ajaya – I’m sure you’re right this is a lot harder than it looks – I’ll let you know when I’ve tried it! Mrs SIngh made it look so effortless though! SIddhartha – yes you were in spam again – I think it might be something to do with the ‘chefatlarge’ thing. Enjoy your Mum’s cooking – there’s plenty of time for salad. Thanks again and hope to see you soon! ha ha! i am longing for fish and chips with beer! interesting the similarity you draw between fish & chips with bedmi. There is another lip-smacking stuffed indian bread called the ‘puran poli’ , a Maharashtrian specialty where sweetened chana dal is used as a stuffing and the bread roasted on a tawa with ghee. We call this kachodi,..meal looks yum,..
loved your recipe today- perfect for a summer afternoon/ evening! Just wanted to ask what’s the best way to get lemon zest right. Mine turned out bitter the last time I tried :(. Hi Saumya – it’s important only to grate (very finely) very top, zest, layer of the lemon – if you get any of the white pith, it will be bitter! A clarification re: Radhaballabhi & kochuri in the Rarhi/West Bengal styles. (There can be other styles in West Bengal than that of theRarh gentry). “Kochuri” is whole wheat flour and has an urad dal filling, wet paste, minimally seasoned with asafetida, and perhaps a hint of ginger and crushed black peppercorns. It is relished as a mid-morning meal with Bengali style jalebis, and a very simple “torkari” of potato and nearly-ripe sweet pumpkin (with its skin on; fully ripe pumpkin would have too hard a rind for pleasant eating and would be too sweet and melt as well, into the curry. The particular texture of the almost-mature pumpkin is important here.) This “curry” is almost devoid of seasoning. There are no chatnies or anything else accompanying this particular trio, unlike the case in Northern India. The three are meant to be eaten together, in tandem or together. Excellent when done right. Radhavallabhi is prepared from white flour and has a filling of crushed green peas. “Vallabha” means “lover” and the dark green pea filling is supposed to suggest Lord Shyamasundara, SriKrishna, He Who is the Entrancing Dark Green Beloved of Shri Radha. This is one of those conceits in food that Bengalis delight in. What it means, though, that without the green pea filling, there is no Radhavallabhi, only some restaurant fleecing the ignorant Delhi residents with promises of false Bengali cookery!! The green peas need to be fresh, because the frozen ones do not give the right taste. I have tried to replicate this in vain. You need to grind the peas to a coarse texture, preferably on stone. 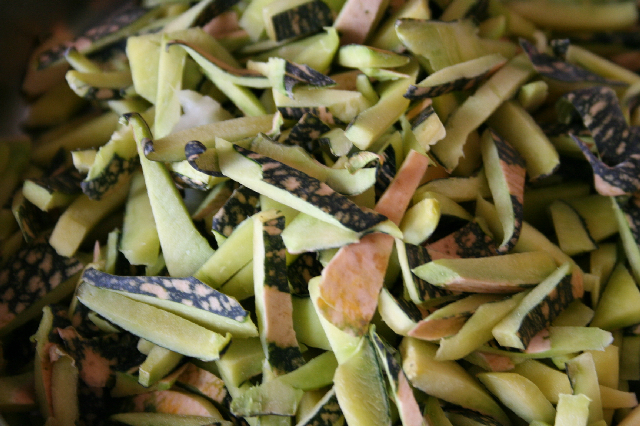 Grind with water fennel and fresh ginger. The tadka is asafetida, followed by the fennel and ginger. Next the peas, which should only be briefly cooked with scant sea salt added, but graced with a good amount of cane jaggery. Remove and cool, once the jaggery has been incorporated. 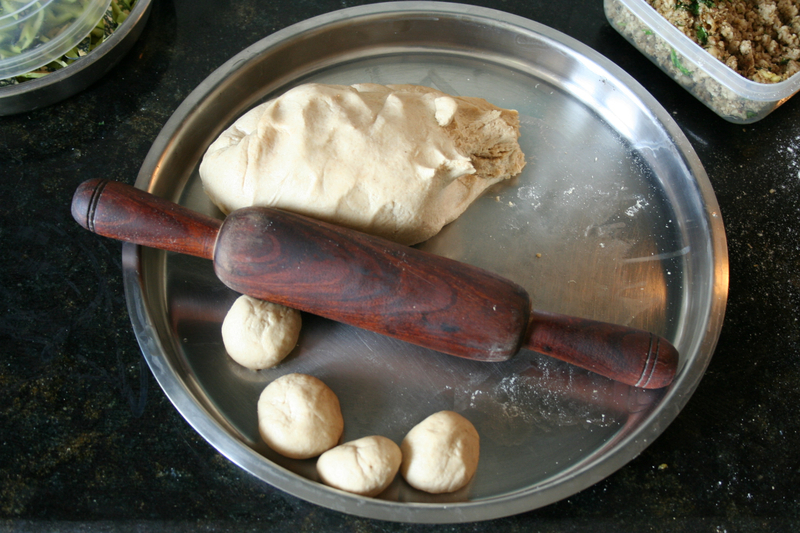 White flour with a little ghee is made into dough balls, rested, filled, rested under cover, rolled fairly thin with care and gently fried to create the Radhavallabhi. The crushed pea filling can be stuffed into mashed potato, rolled in cornstarch, since egg is avoided, rolled in a particular type of “orthodox” (!!) 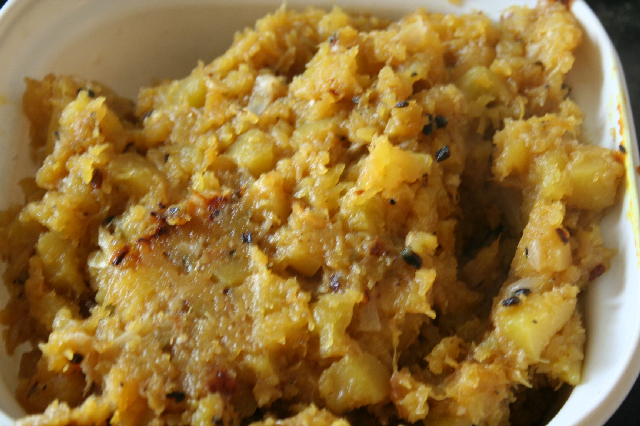 breadcrumbs, and fried, to create a Bengali “chop”, one among several of these “vegetable chops”. An alternative is taro baked in its skin, then skin removed and mashed,stuffed, and fried as above. A different texture, and taro is native to Bengal. Also,it does not require refrigeration and can be stored in the ground until sales several months post-maturity, immune to pests/diseases. This is an important advantage over potato, that requires cold storage, and expensive electricity. Taro is important to Indian cropping systems and important if we are to survive as a nation. Hi, I have never eaten Radhaballabhi made of green peas. The kochuris made of green peas are usually winter special and called,’Koraishutir kochuri’ that goes well or served with Bengali aloordom. 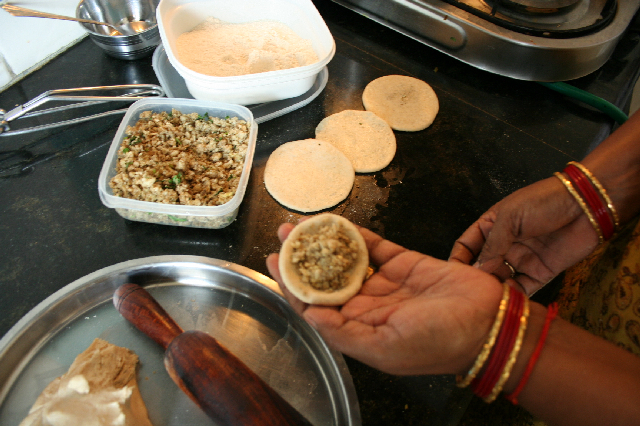 Radhaballabhi is stuffed with urad daal like kochuri but instead of wholemeal flour, plain flour is used and its size is larger than a kochuri. This is served with aloordom or chholar daal or both. At Dakshinshwar I eat in a famous sweet shop every time I go there.